Larry Estrin of Eugene Photography did a fantastic on all our photographs. He made the pictures come alive, especially the one of my mom and dad. I would recommend Larry and Eugene Studio to anyone. Thanks again Larry for a superb job! Larry is the photographer and he is great. He is detail oriented and professional. When it comes to the product he spends so much time making sure you get what you want and that the product is something he is proud to put his name on. My new husband and I have made a relationship with Larry that will last for many years to come. Thank you Larry! Jeana M. Santa Clarita, Ca. Larry is awesome. He photographed our wedding, and was totally organized, totally on the ball, accommodating to our needs, and most of all, cheerful. His pleasant disposition was infectious. It was amazing how he managed to take hundreds of photographs of all the relevant groups without interrupting the festivities (too much). – Malcolm R Covina, Ca. Since the first day we met Larry we knew that we wanted him to be our photographer at our wedding. He is very personable, creative and caring. He goes above and beyond to capture the perfect pictures. Larry took our engagement pictures and wedding pictures He also created our save the dates and our sign in book at our wedding. We weren’t going to purchase a wedding video but Larry worked with us and our budget and I am so glad that we were able to get it. Every time we watch the video we are able to relive the whole event. Till this day we continue to receive lots of compliments on our pictures/ video and we are always excited to recommend him to our friends and family. I can’t wait to get our wedding album. I know it will be absolutely perfect! I am so glad that I chose Larry from Eugene Photography to take my wedding pictures! What a class act! I was married in St. Vincent de Paul Catholic Church in Los Angeles, and had the reception at the Castaway Restaurant (Starlight Ballroom) in Burbank, CA. Since Larry had already photographed several weddings at these locations, he knew exactly where he wanted us to pose for the best background. We met with Larry to discuss our wedding portrait wishes well in advance, and he had plenty of suggestions and samples of his work to give us more ideas. I’ve compared my photos with many others, but the quality is what stands out. Larry has an excellent work ethic and focuses his energy toward producing the highest quality photographs. He managed to capture the special, unexpected moments of my wedding in the most sincere way. All my friends and family cannot stop commenting on how beautiful the pictures of my wedding album turned out. As promised, Larry recently took my Anniversary picture for FREE ( As part of his contract, he includes free Anniversary pictures for life when you hire him as your wedding photographer). My husband and I are both very happy with our Anniversary photo as well! If you have a big event coming up, Larry is the only photographer you need. The man not only has a heart of gold, he is the best photographer in the business! Larry is truly one of a kind. He is now our family photographer! A second generation photographer, Larry has dedicated his career to capturing special moments for us to cherish, always. If you hire Larry, your photographs will not look like your friend took your wedding photographs with their iphone. Larry knows how to capture the moments, position people for photographs for optimal imagery and be super creative with computer programs to alter images to truly make works of art. Being from the age of the “darkroom”, Larry understands cameras and lighting in a way that my generation will take years, if ever, to fully grasp. When I was shopping for photographers, I spoke with a lot of people my age (25-35), with fancy equipment and a basic understanding of photography. I don’t know what you are looking for in a photographer, but I was looking for an artist. A true veteran of photography. Larry’s energy from the beginning was magnetic. He is a la carte, so you don’t have to pay for things you could do without, or want to get at a later date after you have recovered from your wedding expenses. We elected to also do an engagement photo session wherein he met us at 3rd Street and Santa Monica Pier. The photographs he can make into a sign-in book, calendars, whatever you want. They were great holiday gifts for our family. 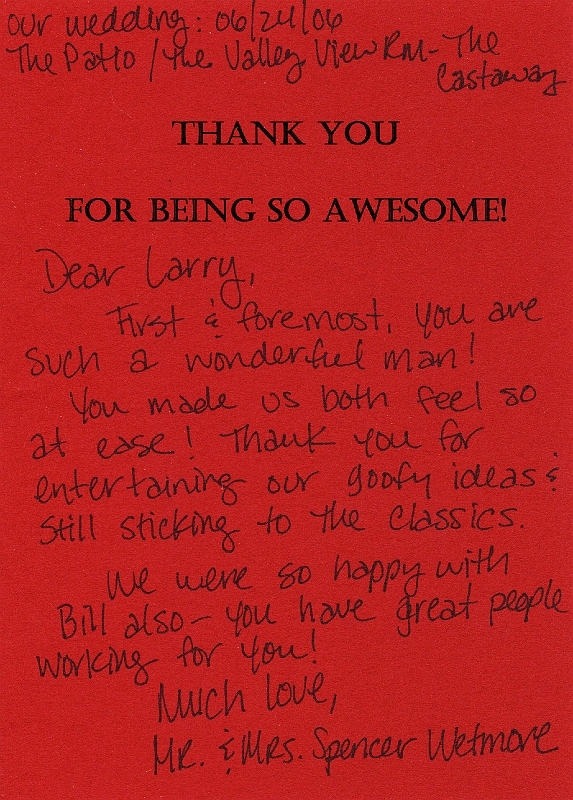 When we did this session, we got to know Larry and Larry got to know us. For me, my eyes are light so I blink and get puffy eyes in the sun. Larry saw this right away and positioned me to show my best side! He was very creative with finding “production value” and positioning my husband and myself. He includes a free engagement photo as part of his standard package, even if you choose not to do an entire session. He also offered for me to come in for a test shoot before the wedding with my hair, make-up and dress to test lighting etc. Larry was at the wedding from hours before until the very end. Larry loves what he does. It is more than a job, but a life long mission to capture moments in our lives. He is a member of our family now and he includes an anniversary photo for the rest of our lives as well. We look forward to sharing future memories of children, bar/bat mitzvahs and anniversaries. Erika showed me the CD you gave to her of our pictures and I just wanted to say how thrilled I am with how they came out. Every one is better than the next, and we couldn’t be happier with the work you’ve done. The same goes for the engagement photos you shot of us. You have been an absolute pleasure to work with and I just wanted to say thank you so much for beautifully documenting our special day. I know Erika has already given you a glowing review on Yelp, but if there I anything else I can do for you, please don’t hesitate to ask. I got married under the redwoods in Santa Cruz last fall. Larry, from Eugene Photography did an AMAZING job capturing the images of the event. I work in the film industry and I cannot express how important it is to find a photographer who knows the stuff, like Larry. Shooting stills is a skill that has been a bit bastardized by the advent of digital cameras. Just because it looks good on the monitor doesn’t mean you get a quality photo. Larry understands levels of light. He understands the emotional effect of soft verses indirect light. And what’s more, he comes with the equipment to get the quality photos that will really POP. You get top of the line professional photos from a pro. AND he’s affordable. I cannot speak higher of this man. He even knew how to get the flower girls to shine. Great attitude and a pleasure to have coordinate and be by your side on the big day. Tess B. Woodland Hills, Ca. Larry is a true artist. He’s a genius with the lens. His skills blew my mind. 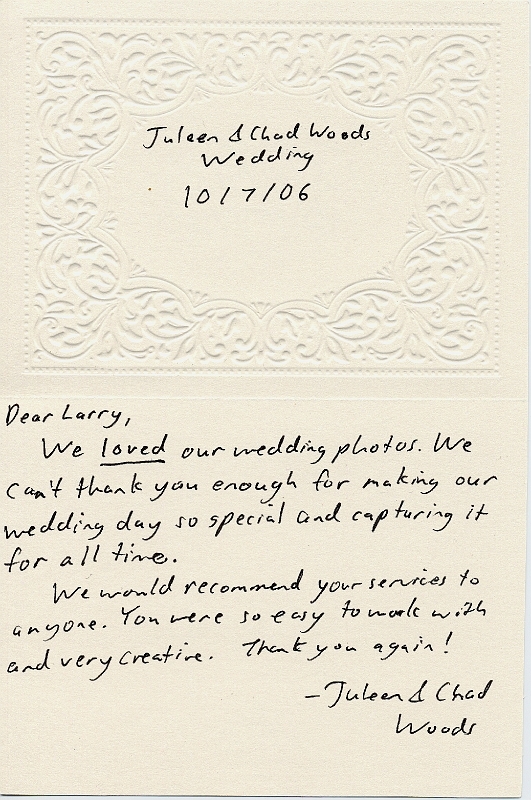 We hired Larry because I had seen one of his photographs at our chosen wedding venue. The lighting, composition and color were perfect. I felt the emotion of the moment captured in the picture. We met with Larry and he gave me such confidence that we hired him on the spot. Our engagement pictures were almost a total disaster. We arrived at the beach and were immersed in total gloom. My heart sank and Larry kept a positive attitude promising that he had the magic to make it work. When we saw our pictures I jumped up teary eyed and hugged him. He performed miracles. The pictures looked fantastic! He not only made the beach look romantic he edited the clouds away and lit us perfectly. The color and depth of the photos were mind blowing. I would recommend Euguene Photography to everyone! Thank you Larry! Tim D. Los Angeles, Ca. Words can’t express how happy all of us are with the photos. You are so much fun to work with and you make everyone feel so at ease. Everyone who has seen them thinks that they are terrific. Our biggest problem is choosing the ones we want because they are all beautiful. Dr. Morris and Marilyn Fink Encino, Ca. Eugene Photography was recommended to me by my wedding location and as soon as we met Larry, my fiancé and I knew we wanted Larry to photograph our wedding. Larry is extremely knowledgeable and takes some amazing pictures!! He will take the extra time to make sure he gets all the shots of the day. I would highly recommend Larry to photograph your wedding or event! My husband and I were married at the beautiful Kyoto Hotel in Downtown Los Angeles April 1st, and found Eugene Photography on the hotel’s preferred vendor list. After speaking with the owner and photographer Larry Estrin, I was very impressed with his enthusiasm and helpfulness regarding all my questions. He seemed like a really nice guy that knew what he was talking about. And with many years of experience shooting weddings, he seemed confident he could capture every moment I wanted to catch, as well as others he would catch on the fly. After we met, my suspicions were confirmed as he was even more friendly and helpful in person. After looking through his portfolio and seeing the other prints at his studio, I was very impressed at how professional and beautiful his work was. I especially loved his candid shots and his color work. So we hired Larry to shoot our wedding, and it was one of the best decisions we made throughout the wedding process. We loved having him around the day of the wedding. He was very friendly and helpful and didn’t add to the stress of what was already a super hectic day. His pictures were fabulous and we loved the candid shots he got of our wedding party and of our guests. He also captured some really stunningly beautiful pictures of us in the setting sunlight. Overall, our experience with Larry and Eugene Photography was wonderful, and I would highly recommend him to all those future brides and grooms out there. There are so many things to stress out about on your wedding day, but with Eugene Photography there will be one less thing. We chanced on Eugene photography when I purchased a Groupon for a family photo. We wanted to have a nice portrait done for the holidays to place on an empty wall over the fireplace. Larry is phenomenal!!! His relaxed demeanor put the whole family at ease, especially my 3 year old twins that can be virtually impossible to photograph. The portrait came out perfect….a work of art I might add. I don’t think we’ve ever taken such a nice family photograph. I’ve gotten so many compliments since hanging the portrait…we only wish we had done it sooner. 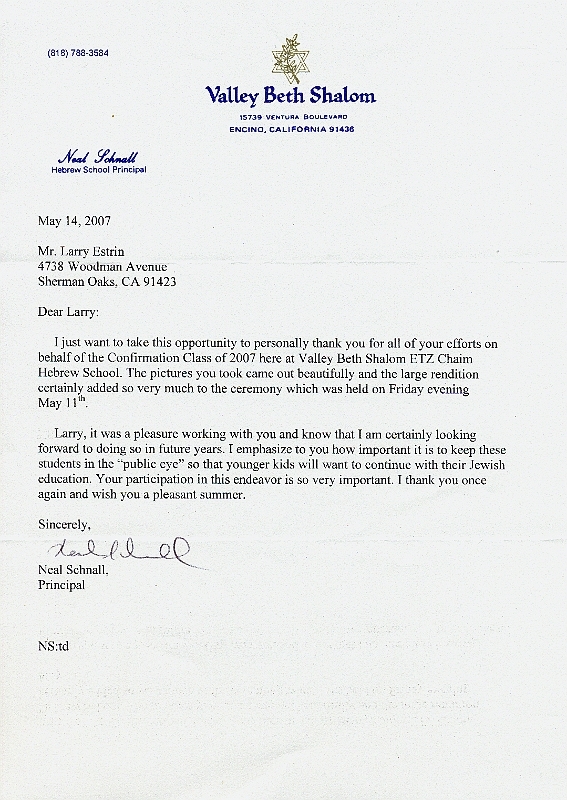 Thank you, Larry….you have more than exceeded our expectations and would recommend you for any portrait or event. Bessie G. Porter Ranch, Ca. I answered my business phone the lady asks to speak to R—R—. I replied, “This is she”. She said, ” I had a lot of legal assistants to choose from, however the real reason she chose my company was because she liked the photo on my web site!” She believed it captured the real essence of a nice, professional lady, the photo was so believable. Wow! For me working with Eugene Photography was really fun. Larry is relaxed and confident. I guess there is no substitute for experience. I wouldn’t go anywhere else. Woohoo! Eugene Photography is a second generation business–father, son. Larry’s Photo of me has actually brought me business and the clients don’t hesitate to say so and ask where it was taken. – Rebecca R. Moorpark, Ca. I can’t say enough good things about Eugene Photography. Larry is very easy to work with, flexible, and things of all the little things so you don’t have to! He photographed our wedding twenty years ago, and the photos were so beautiful that the hotel put one up in their catering office. He just photographed our daughter’s bat mitzvah and did an amazing job. The photos are beautiful and he captured every possible moment…he is somehow everywhere at once and yet completely unobtrusive. We also had him create a photo slide-show which was really amazing….exactly what we wanted for her special day. Highly recommended! Larry of Eugene Photography is an incredibly talented, reliable and hard-working photographer. He photographed both of our sons’ Bar Mitzvahs. He was the first to arrive at the location and the last to leave. He helped create memories that will last forever. He is the consummate pro, trustworthy and easy to work with. He listens to the client and his needs. He took a huge number of high quality photographs. I can highly recommend him for all occasions.